The fact is that the IEC 61850 represents the migration from the analog to the digital world to the substations. Accordingly, industry faces a period of transition, also noticing the effects of IEC 61850 in the traditional testing and maintenance procedures, which are no longer valid. The IEC 61850 requires the development of new dedicated tools, verifying that messages are correctly moving over Ethernet, replacing the previous test processes. It is required an understanding of the unseen data flow in the network and the assurance that the protection systems will operate properly. Points previously hardwired are now broadcast onto an Ethernet network via the IEC 61850 messages, the so called GOOSEs. The GOOSE (Generic Object Oriented Substation Event) replaces the wires between protective relays and other equipment. Each IEC 61850 GOOSE message encodes a large number of parameters such as status changes, releases or trips between IEDs, blockings, signals, etc. Therefore, the IEC 61850 standard demands new technical tools to make it easier for engineers and technicians involved in the commissioning and testing process, to check these new installations. New relay test sets, such as the SMC MENTOR 12, are now IEC 61850 compatible, using the information contained in the GOOSE messages as logic inputs, and also able to broadcast GOOSE messages as logic outputs, similar to the way they actually works, but avoiding the wiring of the binary I/O to the relay I/O, since all the process is now through the IEC 61850 bus. The optional MENTOR IEC 61850 is a GOOSE messages plug & play board that installs into the control bus of any MENTOR 12. Checking the status and changes of GOOSE messages in the IEC 61850 substation. Another essential task is checking the correct broadcasting of the IEC 61850 GOOSE messages to all the IED’s installed in the substation, making sure that there are no problems either in the IED, switching, or the interconnection cables, assuring the correct communication in the whole system. These tasks involve a large number of IEC 61850 Datasets and GOOSE messages, which by definition are (to say the least) cryptic and difficult to read, to identify the origin, the issued time and the information contained, difficult to know the status, etc. The test instrument must assign “electrical names” to the different IEC 61850 GOOSE messages, and indicators of colors to indicate different status, avoiding the need to decode them from the raw information inside the message. It is also necessary a handheld device with an easy and dedicated control, that fits in reduced spaces, exactly as a classic multimeter does, to connect in the panels. This new “IEC 61850 multimeter” essentially replaces a voltmeter checking the continuity of a physical wire termination. The test instrument must also be risk free to write or to change any configuration in the network, a risk that is very evident using a non-dedicated system such a computer. 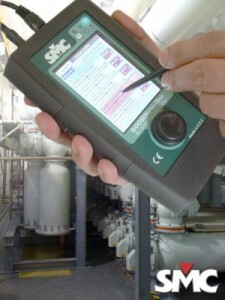 SMC recognized these challenges at the introduction of IEC 61850 in main utilities, and designed the GOOSEMeter One, a general purpose IEC 61850 GOOSE sniffer and dataset monitoring instrument, that meets and responds to the above mentioned applications and tasks, making them easy to be performed and more efficient. SMC continues to explore advanced applications and engineering improvements with the goal to continue pushing the benefits of IEC 61850 beyond what is now possible. For more information, please check the related SMC IEC 61850 products or contact SMC.